Ruthy Hebard powers through the Indiana defense to score. Photo courtesy of Indiana Athletics. 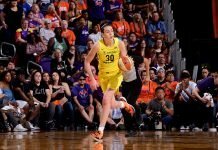 Eugene – Behind Sabrina Ionescu’s NCAA record 18th career-triple double, the Oregon Ducks out-muscled Indiana, 91-68, Sunday to advance to the NCAA Tournament’s Sweet 16 for the third consecutive year. The junior had 29 points, 12 assists and 10 rebounds for her eighth such outing this season alone. But both Ionescu and her teammates said her individual performance was secondary to the win. Satou Sabally, who scored 19 points, credited Ionescu for her team-first approach. Erin Boley added 14 points for the Ducks, and Ruthy Hebard 10 points, as they steadily out-paced the Hoosiers in every quarter, beginning with a 9-0 run in the second. Indiana point guard Bendu Yeaney went down with an apparent left Achilles injury at 3:04 in the third period, which caused her team to struggle down the stretch, as she did not return. Oregon coach Kelly Graves said he and his team were thrilled to return to the final 16, which will send them to the nearby Portland regional this weekend. 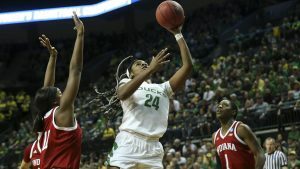 Two of the other teams headed to the Northwest to decide the Final Four – Arizona State and Mississippi State – are quite familiar to the Ducks, as are both of the possible final opponents, in Syracuse and South Dakota State. Indiana was selected at-large by the Women’s Basketball Selection Committee. Coach Teri Moren said that despite her team’s miscues against the Ducks, she is proud of their journey. The Portland regional tips off Friday.